With the increased usage in smartphones and tablets its now vitally important to consider your website both in terms of desktop users and mobile users. Each user has their own needs, but both want to be able to easily view your website, find what they are looking for and have a good user experience. Same content or different content? It might be that it’s not appropriate to deliver the same content to different sized device users. For example, your mobile users might be more interested in finding your nearest office or shop than they are in browsing through your extensive product portfolio. Else the issue might be about getting the same content in front of each user, but changing the user interface to one that best suits the device they’re using. A good user experience is about ensuring that you know who your users are and what they’re likely to want to do, in different scenarios and whatever device they’re on (if you’ve already got a website then you can use analytics to determine the devices most users access your website on, and what they do once they’re there). Find out more about understanding your users. 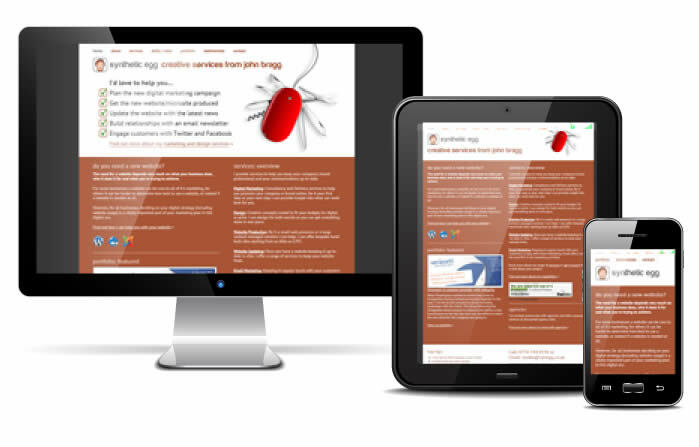 Responsive web design is an approach that adjusts the presentation of content based on the size of the device the user is viewing the website on. I offer responsive design and development to help deliver a great user experience no matter what sized device a user is engaging your brand on. Did you know that if your site isn’t mobile-friendly then you won’t be performing as well in Google? Find out more. Get in touch to discuss your options or if you know what you want then request a free estimate.